The transport sector is the main source of emissions in Mexico, responsible for 18% of indoor greenhouse gas (GHG) emissions and 22% of black carbon, according to the National Greenhouse Gas Emissions Inventory (INEGEI); it is therefore a sector with great mitigation potential. Against this background, one of the clean energy alternatives has been the use of electric or hybrid motors. Electromobility contributes to greater energy efficiency and supports the reduction of polluting emissions through the use of alternative sources to fossil fuels. To ensure it plays a relevant role, the private, governmental and academic sectors, as well as civil society, should work together to generate public policies that promote this technology. In this regard, the seminar “Electromobility: A Path to Follow for Improving Air Quality” began by emphasizing the benefits of replacing transport powered by fossil fuels with electric vehicles. These include the reduction of volatile organic compounds, direct effects on health and decreases in the consumption of gasoline and natural gas. Eduardo Olivares from the Ministry of the Environment and Natural Resources (SEMARNAT) discussed the relationship between Nationally Determined Contributions (NDCs) and the transport sector, highlighting the importance of public policies to strengthen electromobility in private automobiles, since these represent 87% of the sector’s emissions. In this context, Alejandro Villegas from SEMARNAT shared some data about the negative externalities of the transport sector. In the Metropolitan Zone of the Valley of Mexico, six out of 10 days of the year there is poor air quality caused by ozone, and five out of 10 days due to particulate material, both of which have severe public health impacts: 21,000 premature deaths each year and economic costs of up to 3.2% of GDP. That is why the National Electromobility Strategy is being promoted. Soon to be published, the strategy is associated with the Sustainable Development Goals (SDGs) of the 2030 Agenda insofar as it seeks intermodality between the electromobility of motorized and non-motorized vehicles (scooters, bicycles, etc.). It is very important for the transport sector to meet the goals of the NDC. Juana Itzchel Nieto of the National Institute of Ecology and Climate Change (INECC) explained the challenges of implementing electromobility in the country. These include the acquisition costs for vehicles, auto parts and batteries; direct and indirect non-fiscal benefits; financing; associated infrastructure and recharge rates; increases in the price of fossil fuels; and tax incentives. 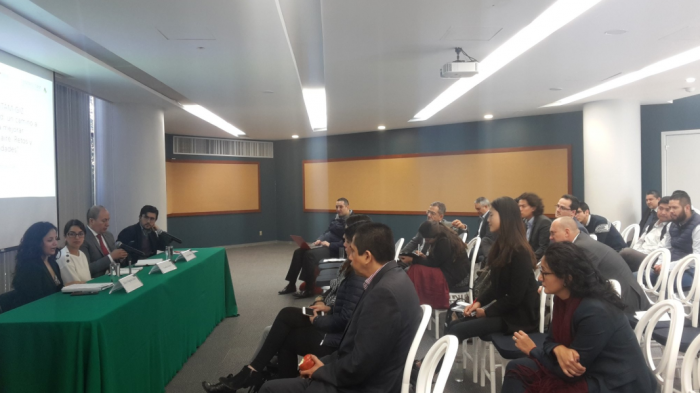 The second part of the seminar covered the technical aspects of electromobility implementation and included participation from the International Energy Agency (IEA), the Carbon Trust and the Mexican Association of the Automotive Industry (AMIA). During the meeting, participants discussed the feasibility of using electric vehicles, taking into account available infrastructure, financing and incentive schemes, and access to technology for the use and charging of batteries.